Good morning everybody. I'll give you three guesses what's happening outside my door. Yup! You guessed it! It is snowing. It's another storm, this one is named "Kari". It's supposed to snow all day, tonight and right on through tomorrow. If that's not bad enough, we are promised another nasty snowy wet day for next Monday too. Sheesh!! 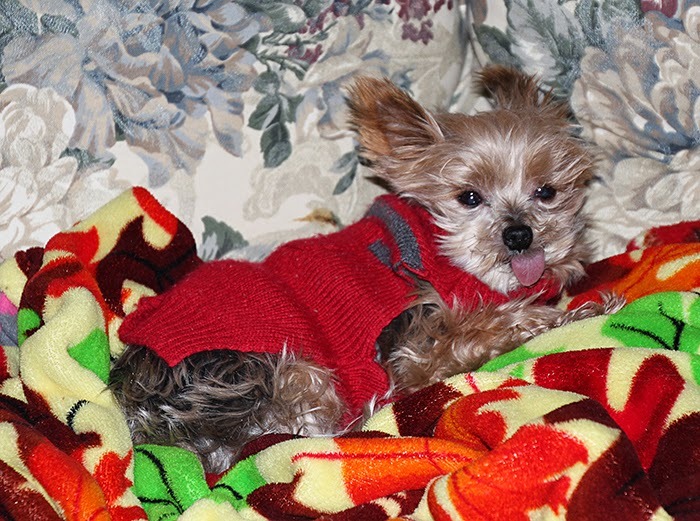 Want to know what Pogo thinks of all this wicked Winter weather? 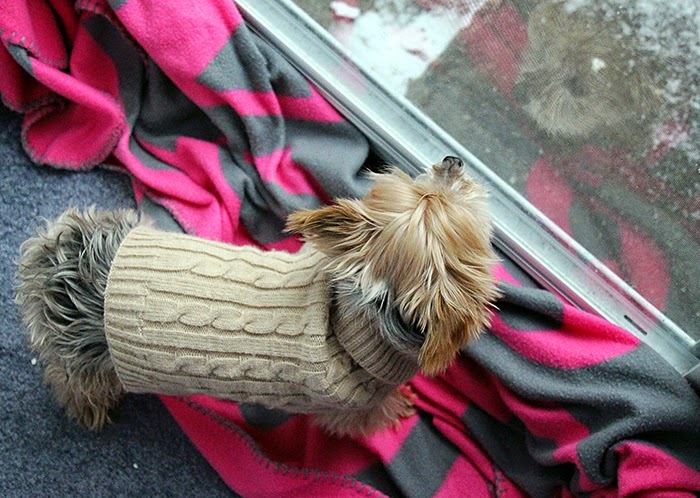 This is how he rides out the cold and the snow. First we pile up a bunch of fuzzy blankets on his little sofa; then he settles in. 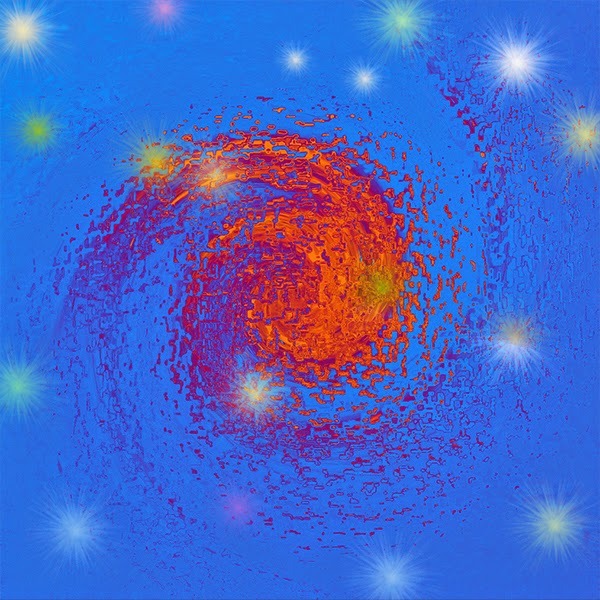 I realize that it is sometimes difficult to visualize what something looks like just from hearing about it. I mention my driveway (parking lot) often when we have bad weather, so I took a couple of photos to show just how big it is. The photos don't show it all, but you can see a lot of it. 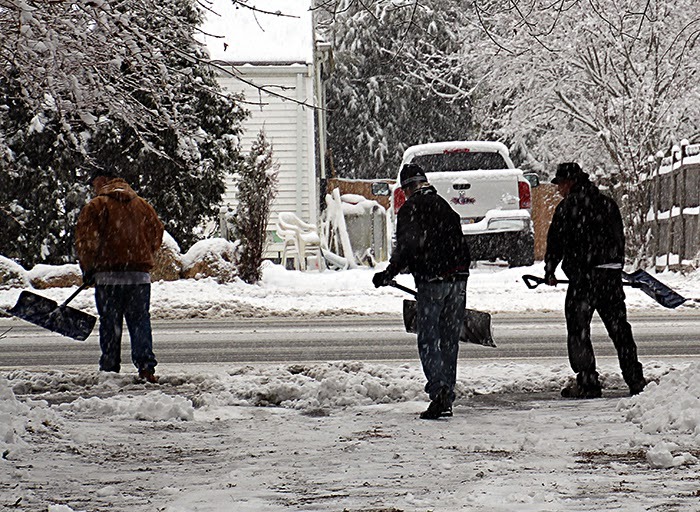 You can see Joe (in the tan jacket) and Mike (in the dark jacket) shoveling. That's my car in the bottom right corner, minus a lot of the snow that it was buried under. These photos were taken through the storm door, which is why you can see the mesh screen imprint on the photos. I finally have some good news for daughter Audrey. She has finally found herself a new car to get around in. 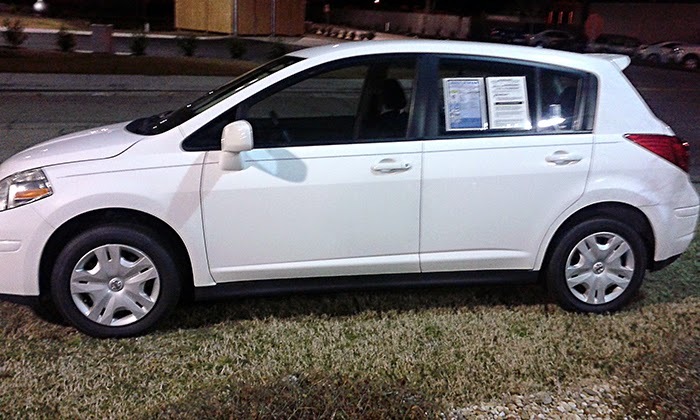 It's a cute little Nissan Versa. Good luck with it Audrey, and drive safely. Your car carries some very precious cargo in it. I have another story to share with you. Audrey was riding in a car one day last week when she spotted something very interesting way off in a field. She took as many photos as she could with her phone, and sent this one on to me. Wow!! Would you believe - an Albino Deer. At least, I think that's what it is. I zoomed in as best I could and could not see a black nose. We've never seen one of these, so of course this was exciting. 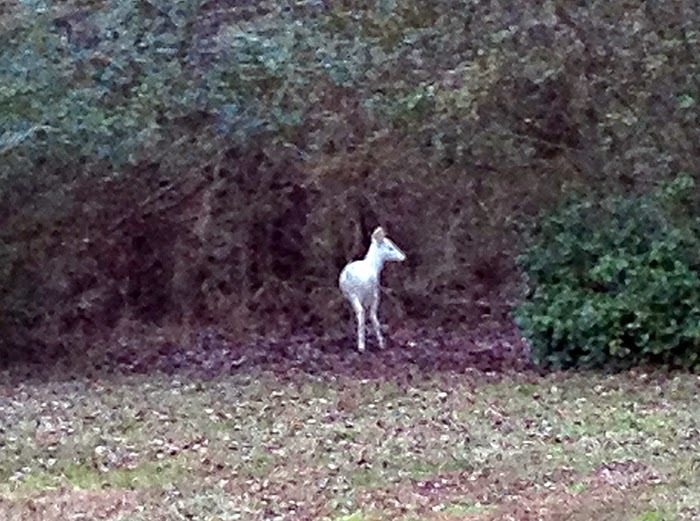 I looked it up on Google and found that there are Albino Deer, and there are the White Deer. There is quite a lot of fascinating history about the White Deer. The difference between the two is that the Albino Deer has a pink nose and pink eyes. The White Deer has a normal colored nose and normal colored eyes. Yesterday afternoon, Joe and I went food shopping, so now I'm all stocked up again and ready for the next batch of weather. Now I'm going to enjoy my cup of coffee and catch up a bit on my blog reading. So, till Sunday, (Woo Hoo! It will already be February!) Y'all be warm and have a fabulous weekend. Good morning. Gosh, it's cold this morning. Currently it is 9F degrees and the sun is shining. The weather man says that it will get up to around 32F degrees sometime today. Then we have more snow coming during the night, and rain and freezing rain for tomorrow. Well now, isn't that nice! I'm watching the Weather Channel, and they are showing all the side streets in Boston, and all the cars still buried in snow. The problem now is that all that snow has to be carted away, but to where? There's no where to throw the snow when you shovel out all these vehicles, so it will be a while before some of the cars make it out of their icy spots. We have two more nasty winter spells coming our way for tonight and tomorrow, and then again for Sunday into Monday. It looks like there is even more snow coming mid week. I, for one, will be ever so glad to see Spring coming with her warm sun and green leaves. Just 51 more days folks! I did not do a "word" photo for today but I have more pix of our birdies. 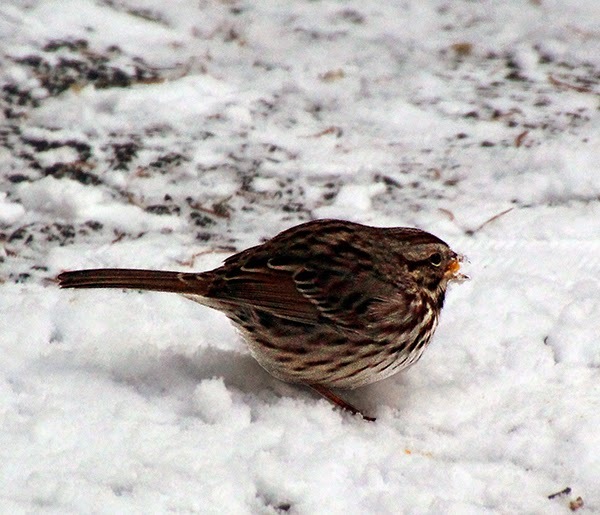 These first two photos show a little finch (I think it is a finch) enjoying lunch at the plate on top of the snow, and the next photo shows another little one enjoying his lunch under my car. 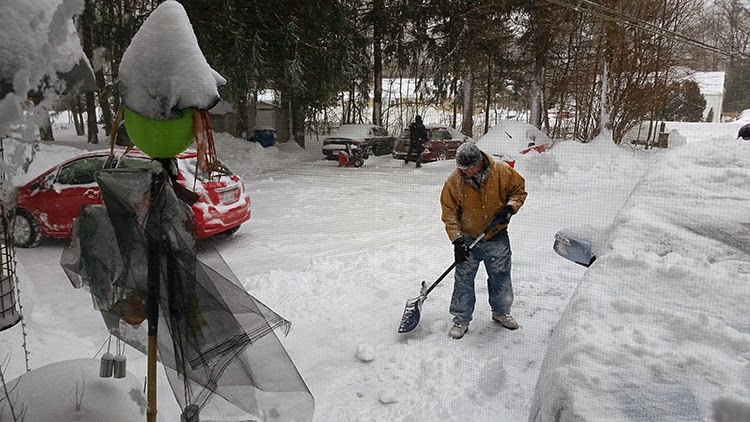 Yesterday afternoon, Joe cleared off my car, and then cleared all the heavy snow off the porch roof. At least now I won't be worrying about the roof when the freezing rain and snow comes tomorrow. I think we'll go food shopping this afternoon when Joe gets home from work so that I don't have to go out tomorrow. I'm hoping to go back to Market Basket to do our food shopping because I found a brand of doggie food there that Pogo will eat. It's the Market Basket brand of "gourmet dinners" . I bought some last week to try, and every day Pogo eats at least half of it to all of it for his breakfast. Woo Hoo!!! I have some fun photos that Dee Dee sent to me, but I'll save them for tomorrow. Right now, my tummy is telling me that it wants a bit of food. So, till tomorrow Y'all be warm and have a fabulous day. Good morning. Well, the sun is shining, and Storm Juno fizzled out during the night. Thank goodness for that! Joe worked wonders trying to keep up with the snow that has been falling since Monday, and the snow plow came in this morning at 7:15 for the last time to clean up the parking lot again. There is a lot of snow on our porch roof, but Joe will clear most of that away this afternoon when he gets home from work. We surely don't need any problems with the roof falling in on the porch. Even though we got a ton of snow here, we were very fortunate that we did not lose our electric power. In reality, things could have been a lot worse, so I am very thankful how things turned out here. Yesterday, I had fun watching our little birdies scratching around for food. The snow had everything buried. 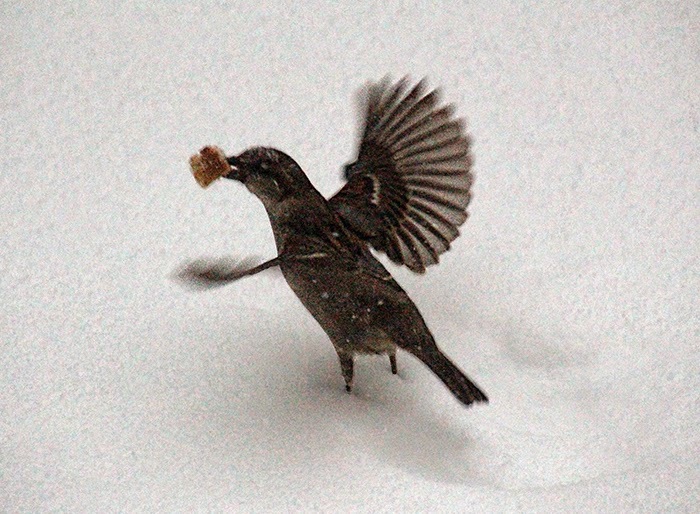 As soon as I would send out more bird seed and bits of bread, the snow would cover over it. I finally got smart and had Joe spread a whole bowl of seed underneath my car. 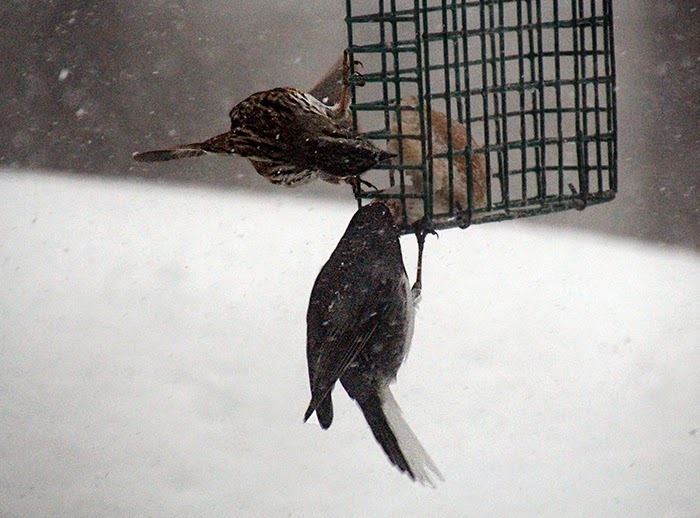 This way the little birds could eat their food and be out of the weather. 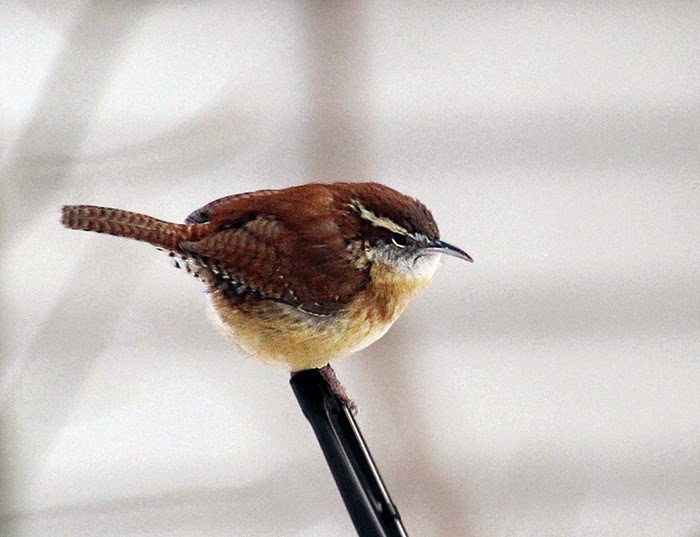 Here are a few photos of our little birds from yesterday. The square feeder in the last photo was almost empty, so I made up some new buns lathered in peanut butter to fill them again. 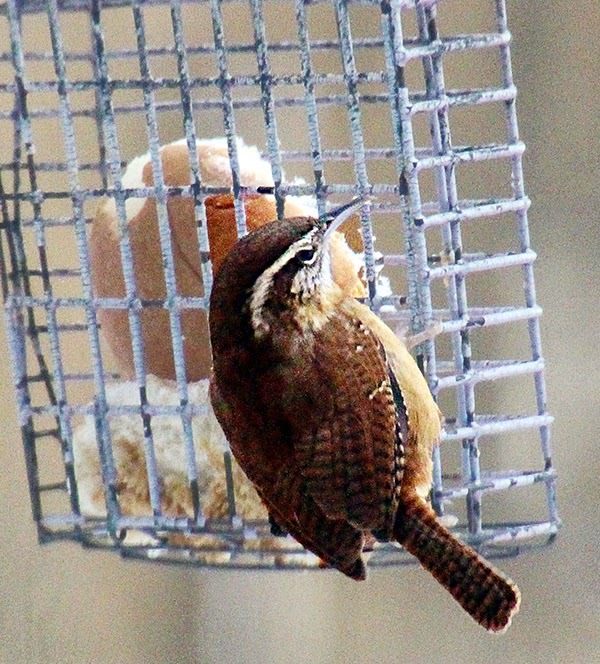 The birds seem to like the peanut butter very much. The word for Day 28 is "Lead" which can be interpreted in more than one way. You can "lead" someone, or you can have something made of or with "lead". I chose a "lead" pencil used for writing. I have more photos and a scrap page to share, but I'll save them for tomorrow. I did spend a little time yesterday trying to figure out how to make a second page here on the blog. The only instruction I could find was a line on Blogger that said "to make another page click here." I did not click it because first I want to make sure that this page won't get messed up if I click that spot. I'll look again today. 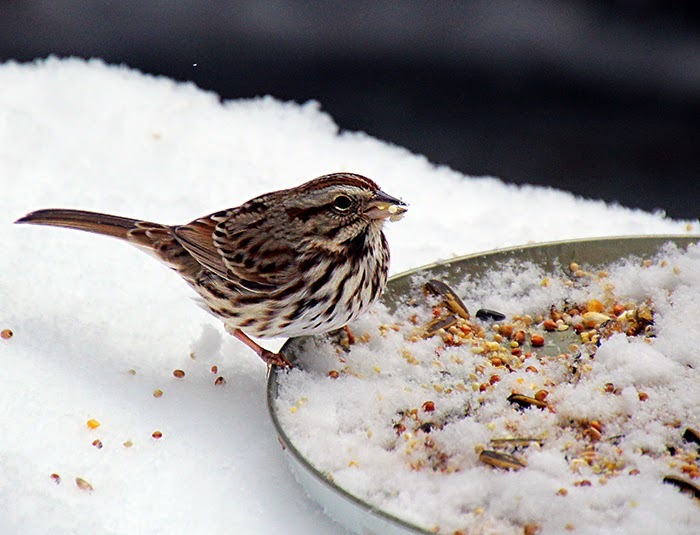 A few minutes ago, I spotted some of our little birds outside my window looking for food, so I just took a small break to put some more food out for them. When I took the food outside, there was a small group of birdies sitting in and on my hedge waiting for the food. 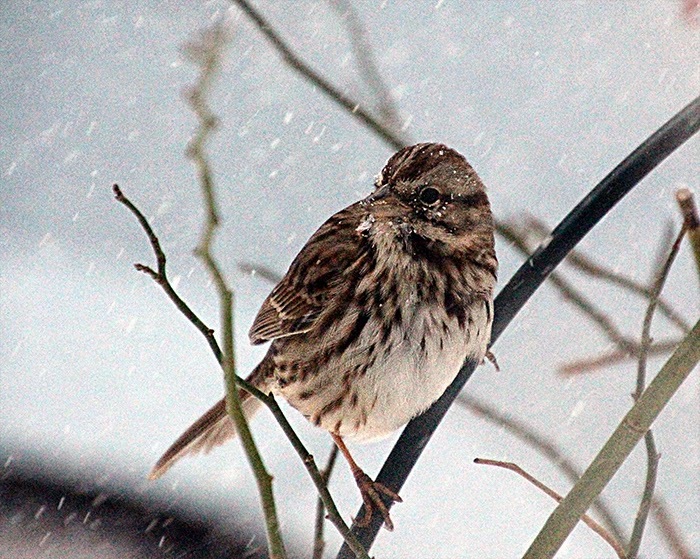 There was a couple of chickadees, a little brown wren, a finch, a couple of dark eyed juncos and a few sparrows. I am always amazed at how they can all get along so well together. Now I really must have myself a hot cup of coffee. 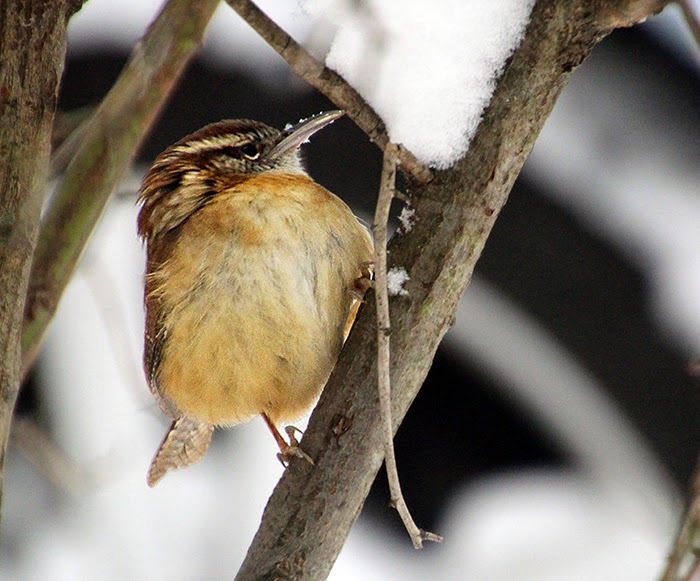 I've paid the plow guy, fed the birds, checked with a couple of the dwarfs, fed Pogo his breakfast and typed my blog. It's time to get some hot coffee and maybe a few bites of something tasty into this old gal. So, till tomorrow, Y'all stay warm and have a fantabulous day. Good morning America!! It's windy, white and cold here in New England. Well, the snow and wind really picked up last evening, and I spent most of the night worrying about my gentle giants. (the huge trees around the house) But it is 5:45 am, and so far all is well. Yesterday I was able to hire a snow plow to come in several times during the storm and clear our driveway. I don't know why I call it a driveway. It's really more like a parking lot. 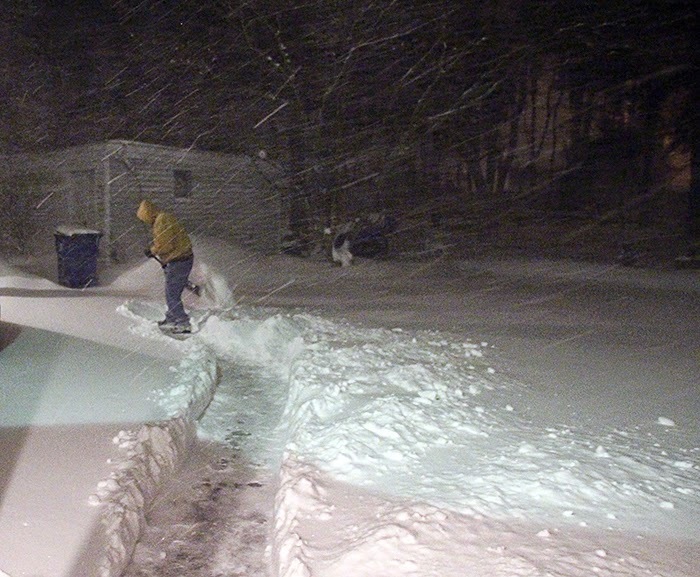 Joe went out every couple of hours till around 11:30 pm and shoveled up all the snow. The governor called for a driving ban beginning at midnight last night, and all other forms of travel would also be shut down. This will stay in effect until further notice. The wind began howling in the evening, and snow has been flying every which way. Yup, it looks like a real doozy of a snowstorm outside. Pogo curled up under a bundle of fuzzy blankets on his little sofa, and I was all tucked in on my lounge chair with the phone next to me. We managed to sleep for a few hours till the phone rang at 4 am. It was the snow plow driver calling to say he would be here in thirty minutes. We already had a foot of snow. I called Joe, and he got up and went outside to shovel the snow away from my car and to tell the plow driver what we needed. 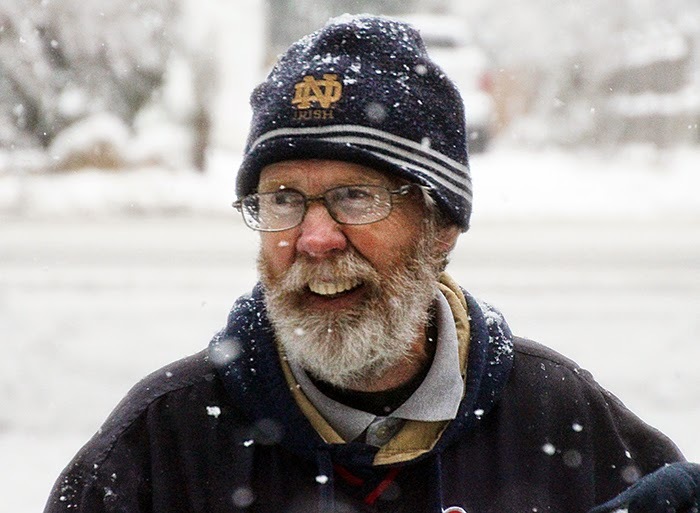 The word for Day 11 was "White", so I think this photo of Joe outside this morning is quite appropriate. I was standing on the front porch when I took this photo, but it was so windy that I soon went right back in the house. 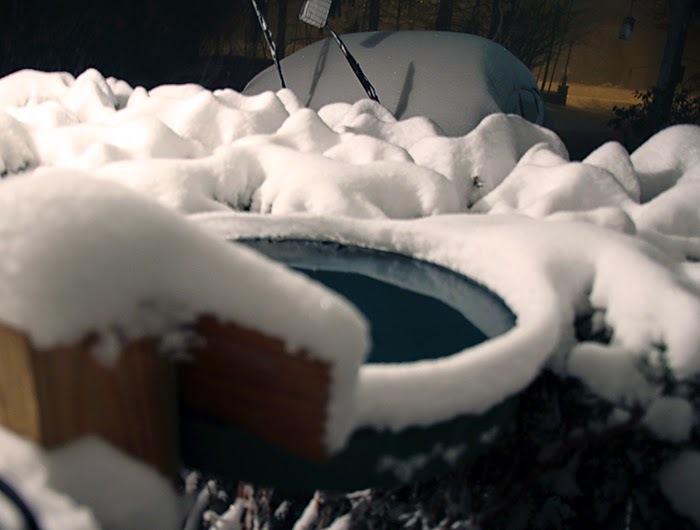 This is just the snow that fell from around 11:30 pm till 4 am. The plow got here around 4:30 am, and I have to say that he did a pretty good job, considering one of the cars got stuck in too much snow and Joe couldn't move it out of the way. Let me tell you, there was a ton of snow in our yard. Well, actually it's still there, but it's been moved around a bit. hehe. Here's a view through my living room window. That large white blob has my car hidden beneath it. I tried taking photos through the door, but plexi-glass does not make for good photos. While I was at the window, I checked the birdie water bowl and put more water in it. 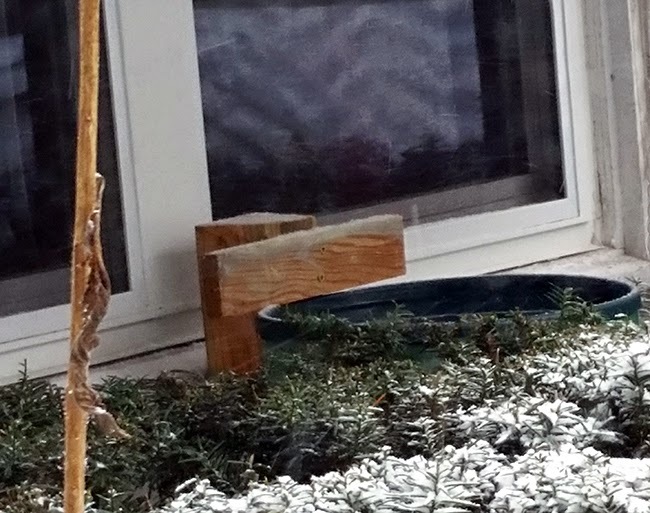 It's in a protected spot, so there wasn't too much snow around it. By 5:15, the plow driver had left, and Joe was on his way back to bed for a few more hours. As soon as some of the dwarfs wake up, Joe will go back outside with some help to move the car that got stuck. The plow driver will call again later this morning before he comes back to plow the yard again. So far, we still have our electric power. Knock on wood, and thank you Lord. The wind is going to be blowing heavy most all day and night again. The real culprit of this storm is this wicked wind. It has the potential to knock down a lot of power lines, leaving a lot of people in the freezing cold. I'm watching the Weather Channel, and there are six states that have called a "state of emergency". For most of us, that means a driving ban, no schools open, no buses or trains running, etc. As long as we don't lose our power, it is sort of like a mini vacation for a lot of folks. Well, I can see the sky beginning to lighten now so I think I'll have a cup of hot cocoa and maybe see about catching a few winks before the plow comes back. So, till tomorrow, Y'all be safe and have a super nice day. We're Getting Ready For A Doozy Of A Storm! Good morning. Well, the snow is coming starting today, and it's coming with a vengeance. It's bringing hurricane winds along with it. The weather man sounds scary this morning when he says that it could dump from two to four inches of snow an hour for twenty four hours non-stop. Now that is scary!! Right now, we are looking at possibly two to three feet of snow for our area. As long as we have power, I'll be posting here. If I'm not here, then you can assume that we've lost our electric power and I'll be back as soon as the power returns. Personally, I would not be disappointed if the whole thing blew out to sea before it gets here. That's my wimpy side showing! They are saying on the Weather Channel that by noon today, all traffic in New York City is to be off the roads; and in Boston, we may have as late as 5 pm to get off the roads and stay off for 24 hours. That's a great idea, but I'm sure there will be lots of folks ignoring these warnings. Why, I don't know, but they always do. We have food, water, blankets, flashlights, a snow blower that might not be much of a help if there is too much snow, and a generator in case of a power outage. The only thing I haven't got so far is a plow to come in periodically to move some of the heavier snow out of the driveway. I'll try to figure that one out this morning. Yesterday, I went looking at one of my backup drives to see if there was room on it for another backup, and I got side-tracked, naturally. Therefore I did not get to work on a second page for my blog. I will get to it, but right now there are more important things to attend to. I thought I might see about getting another delivery of fuel oil to make sure the tank is full, but so far no one seems to be answering the oil company's phone. Maybe their lines are already down? Hmmm. Oh well, we have enough fuel for a while, but once the snow gets here it will be very difficult to get to the "fill" pipe. As promised, here are the latest "word" photos. The word for Day 24 was "Aquatic" so I took a photo of Joe's fish. 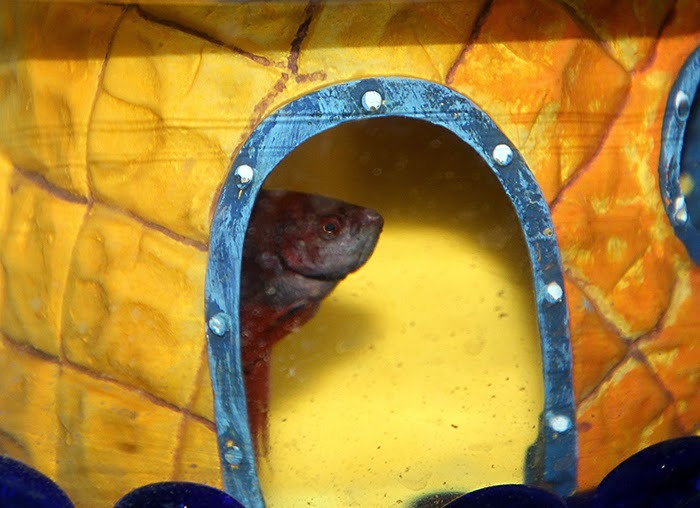 There is a pineapple house in the fishbowl, and the fish likes to stay inside the house a lot. The word for Day 25 was "Flower" so I have a photo of daylilies from my garden. (Obviously taken several months ago. 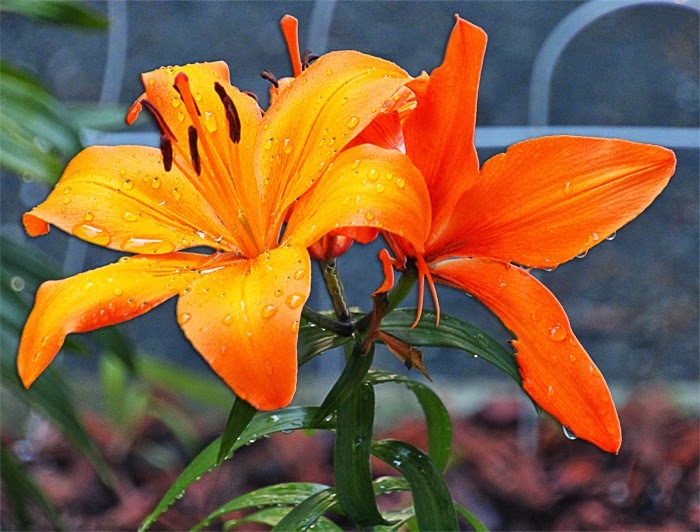 This being Monday, I thought the orange lilies most appropriate. 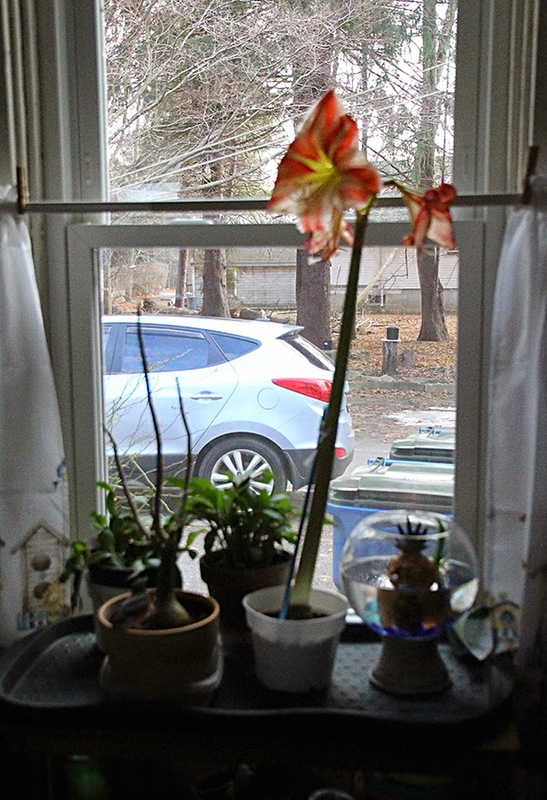 For today, Day 26, the word is "Towering", so I took a photo of our Amaryllis plant that is towering over the other plants on the plant table. Beth sent in a photo for Day 19's word, "Water". 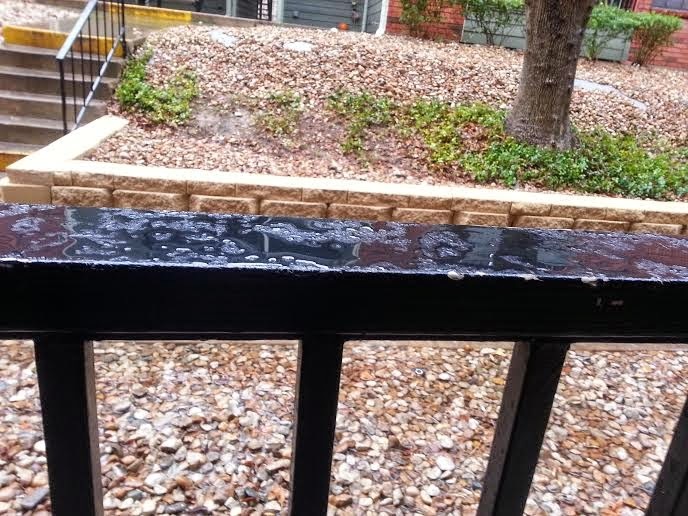 She took this photo of the rain drops that have landed on the fence rail. If anyone else wants to join in with the "Word" photos, please do. I'm getting into the habit of just shooting photos of everything and anything. You never know when one of the photos will match a Day word. Now I must get busy and see about hiring us a snow plow. That's if there are any snow plows available. Most of them are probably all booked already. So, till tomorrow, Y'all be safe and have a great day. Monday until 1 am Wednesday. There is a lot more snow on its way. Storm Juno is promising to dump a bundle of the white stuff on New England. 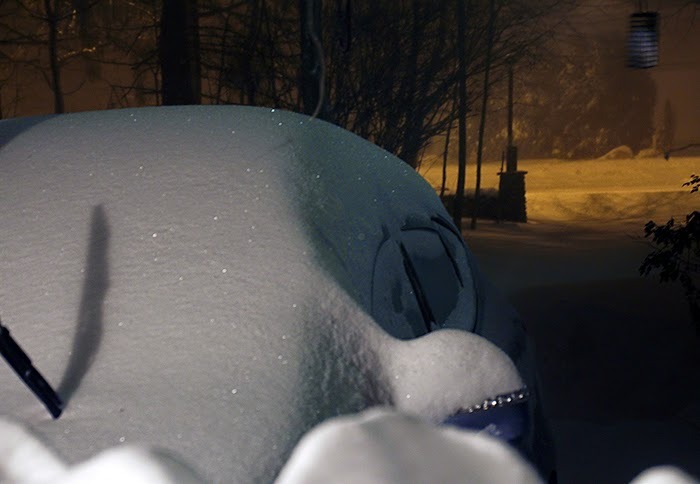 I thought I might share this photo of a snow storm that we had in January a few years ago. 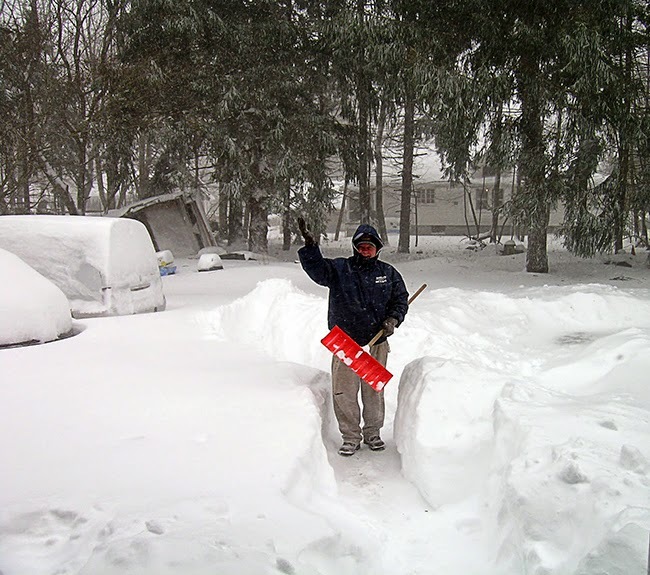 My brother Artie was outside shoveling out the driveway, and in most places the snow was up to his hips. The weatherman is being very scary this morning. He is saying that "Juno" could bring us "feet" of snow, not "inches". One good thing, I had the dates wrong for when Eddie and Kevin had to be in Boston for medical reasons. They do not go this week, they go next week. Whew! I'm hoping that by then most of the snow and ice will be gone. Yesterday we all woke up to fat snow flakes falling, and already more than four inches of snow covering everything. During the day we got a couple more inches. Of course, this was to be the day that the snow blower would break a shear pin when Joe was trying to move all the snow. The snow blower had to go back to the shed and out came the shovels. 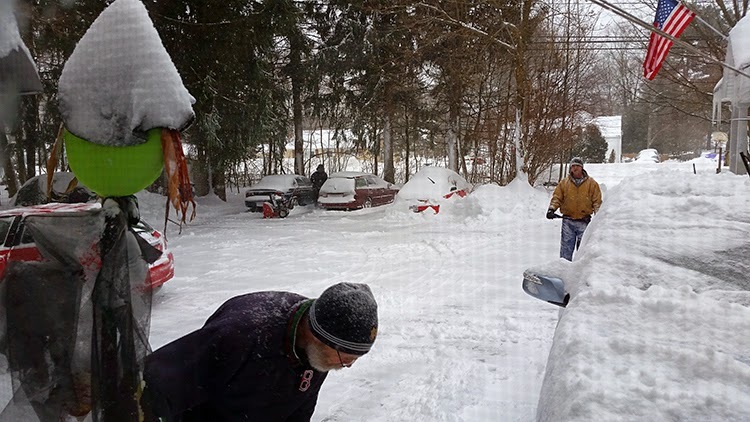 I ordered new pins from the Hardware Store, and a couple of the dwarfs helped Joe with the shoveling. In this photo, the driveway (which is huge) is done and now they are clearing the entrance area by the street. 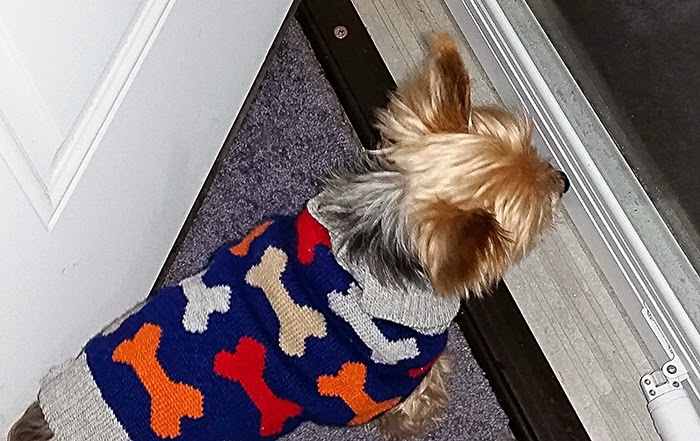 All the activity outside kept Pogo quite busy watching from the door. Until Joe threw a little snowball at the door and scared Pogo away. I'll need to have a chat with Joe about that. Pogo is tiny and so many things are quite scary to him. He should not have to be afraid of Joe or looking out his door. I love the reflections in these photos of my little guy. I do have "word" photos for the last couple of days, but I'll post them tomorrow. This afternoon I'm going to try to set up a second page here on the blog for project photos, etc. The magic word is "try". I'll even see if I can figure out how to set up an upload link. Hmmmm, that should keep me busy for a while. Now I'm going to enjoy a cup of coffee and do a bit of blog reading. So till tomorrow, Y'all stay warm and have a fabulous day. Good morning. The sun is shining, but it is cold here. At the moment it is 22F degrees, but it is supposed to warm up to around 38F degrees. At least that is what the weather man is saying. We still have some nasty winter weather coming, but I'm not sure what or when. I'll tune in to the Weather Channel in a little while to see they are saying now. Let's get right to the Day 23 word "Shave". This is something that Pogo and I don't do, so I have no items for shaving lying around. I almost decided to use an alternative word for today when I remembered something that I bought at the supermarket yesterday afternoon. 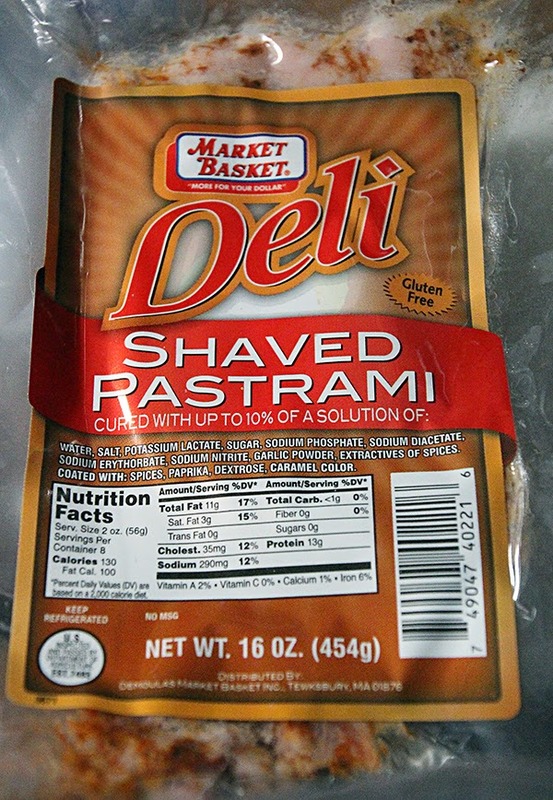 I just got out the package of Shaved Pastrami and took this photo. Hmmm, good thing I bought it! I also have a photo for the Day 5 word "Small". I took this photo of Pogo as he was waking up from a nap on the sofa. 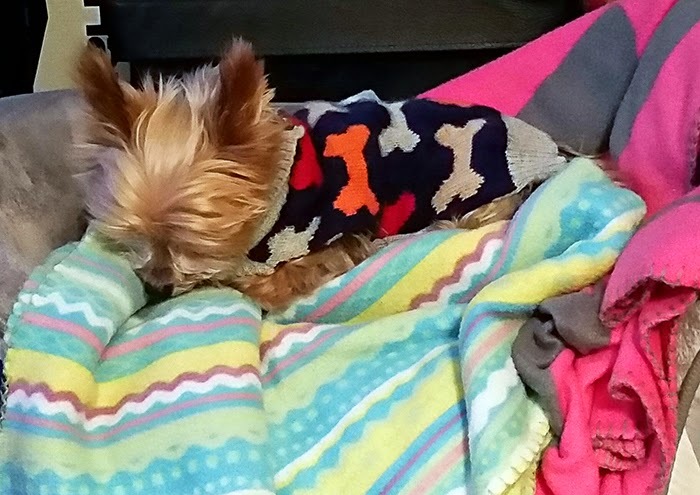 He is very small, only six pounds which is two and a half pounds more than he weighed when I first got him. I also have a photo for yesterday's word "Hope" that was sent to me from Beth, a fellow blogger. 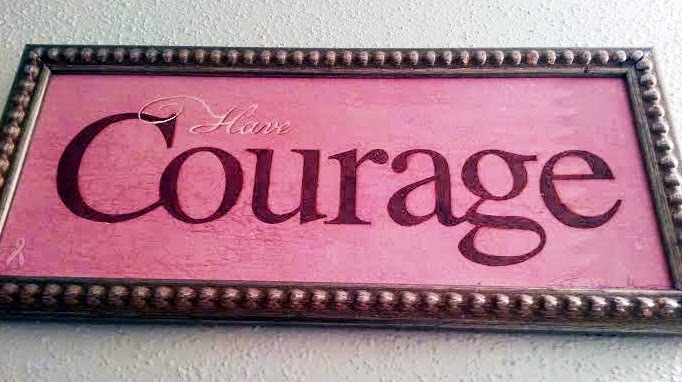 The symbol for breast cancer is on this image, and it is an inspiration for hope that we will find a cure for cancer. Thanks for sharing, Beth. It's more fun to do this project when someone else is doing it too. Well, yesterday after Joe got home from work, we left to go grocery shopping, after a stop by the bank and the post office. The highway is close by the Post Office, so we decided to shop at Market Basket instead of Walmart. This was good because it gave me a chance to pick up a few different items that Walmart does not carry. Like the shaved pastrami! I love this on-line shopping. A couple of days ago, I ordered a book for daughter Audrey, and yesterday morning I received an email telling me that it was already shipped and on its way to her. I think that this is one of the better things that came out of progress. Not only do I not have to leave the house to make a purchase, but I also don't have to make a trip to the Post Office to mail it to anyone. Definitely good progress. I sometimes wonder what my memories will be like if I live to be 100 or more. Right now, I can remember so much in the way of progress. Recently I watched a commercial for a new toilet. It had a sort of laser flush on it. You just pass your hand in front of the flush button, and it does the job itself. My memories take me back to the day when there was a three seater with no flush at all, and then to a "modern" toilet with a wooden water box high up on the wall and a long chain hanging from it to pull for a flush. After that came the "all in one" unit with the flush handle attached to the tank on the back of the toilet, and now one that flushes itself. Amazing! I also remember the cobble stone streets, and my Grandpa coming to visit in a horse drawn surrey. The roads changed from cobble stone to black tar, and now a type of cement pavement. The horse drawn surrey soon became an automobile, to a beach wagon, to a modern new car. More amazing memories. There are so many more, but they can wait for another day and another post. The update for this weekend's weather so far is a little snow tonight, and then freezing rain and snow for an icy tomorrow. Looks like a great day to stay indoors and maybe crochet a while. Now I think I'll make me a hot cup of coffee and see what's for Pogo's breakfast. So till Sunday, Y'all stay warm and have a fabulous weekend. Good morning. I'm watching the Weather Channel, and I guess January is not going to go out without dumping a ton of snow on us. Or maybe lots of rain? Or maybe both. Either way, something is on its way here probably by tomorrow or Saturday. And maybe even more next Monday and Tuesday. We'll just have to wait and see. All of this means that I definitely have to get out today to do a couple of errands and pick up a few groceries. Once the storm Iola arrives here with her wintry mix, Pogo and I may not go back out for a few days. The word for Day 22 is "hope". I thought about what to photograph until I realized I had the perfect subject. I recently placed an order for a couple of things, but needed one more inexpensive item in order to get the free socks that were being offered. (I'll get back to the socks in a later post.) Well, my order arrived yesterday, and this is the extra item that I had ordered. 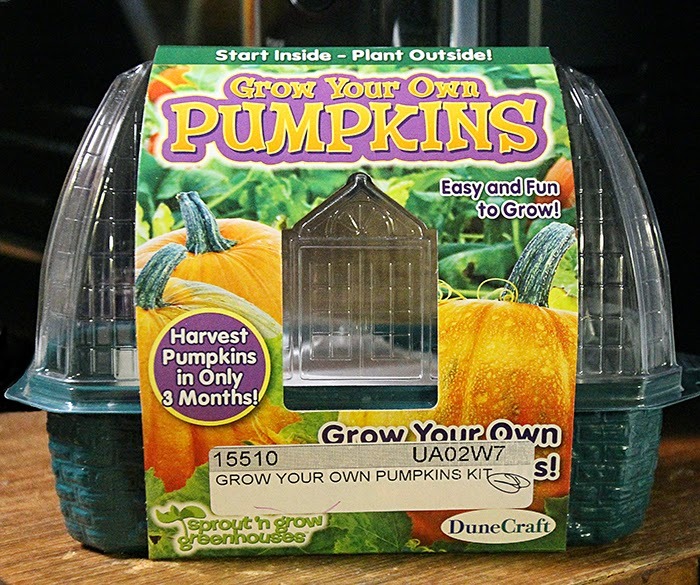 It's a "Pumpkin Starter Garden". I have "hope" that Spring is coming, and we will be growing pumpkins in our garden soon. Per a request in the comments, if anyone needs information or help on making a Blog Book, just send me an email and I'll be glad to help you. You can find my email in my Profile. Once you get started on these wonderful books, you'll get hooked. But they are a great way to leave behind a bit of your life for your family. Yesterday, SIL Eddie came by and got my new oven all set up. We only ran into one problem. He will have to come back in put in a new outlet for my microwave. I do not like having the oven and the microwave sharing the same outlet. But, Eddie is an electrician, so he can take care of this for me. Today I have another interesting article from the newspaper that I thought cat-lovers might like. 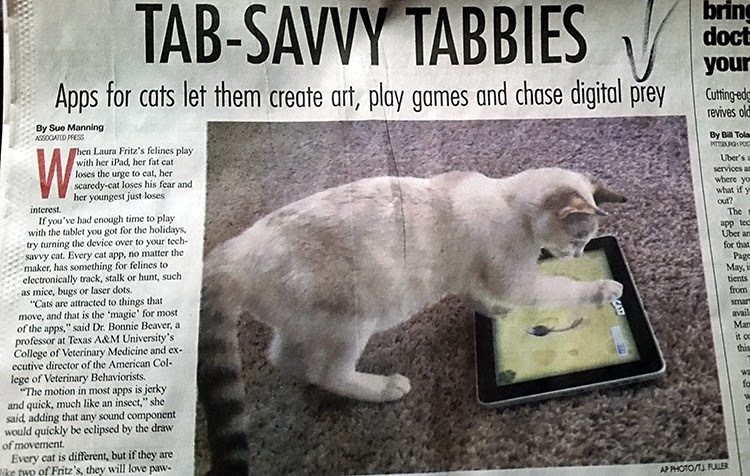 Did you know that there apps for your tablet that lets your cats play all sorts of fun games? Among these new apps are "Paint For Cats", "Game For Cats". "Catzilla", "Pocket Pond" and "Cat Fishing". Two years ago, the SPCA in Los Angeles received a couple of used tablets, and downloaded "Paint For Cats" to see if any of their homeless cats were hiding inner artists. Two of them, dubbed Pawblo Picasso and Frida Catlo, created abstract art that looked like fuzzy circles, and the organization turned it into sellable notecards. So, folks if you are thinking of trading up to a newer tablet you might consider donating your used device to an animal shelter. Think of all the fun these poor homeless darlings could have playing on your old tablets. Well, that's about all my news for this morning. I'm going to enjoy my cup of coffee while I think of what to photograph for tomorrow's word. So till tomorrow, Y'all have a wonderful day. Good morning. I've been up a while, but I've been busy photographing a piece of dust and then playing with it in Photoshop. Imagine. At my age, playing with a piece of dust! The Day 21 word is "dust" so this explains my weird behavior this morning. First I had to negotiate with the dust bunnies to find out which piece of dust they would allow me to photograph, then I had to get their permission to post the photograph here on my blog. 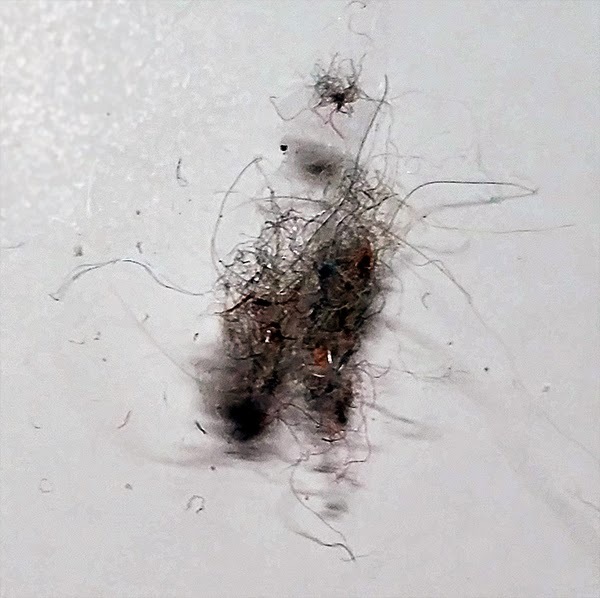 Dust bunnies are very particular about their privacy. So here's my photo (a close up) of a really handsome piece of dust, followed by a bit of dust photo art. I must admit this was rather fun. Pogo is being very playful this morning, crawling all over my lap while I'm trying to type. So I have to keep stopping to play a bit. This is okay though because he is such fun to play with and he gives me so much joy. Yesterday I got a nice surprise in the mail. My newest Blog Book arrived. This one covers the last six months of 2014. Gosh, now I have fourteen of these books. 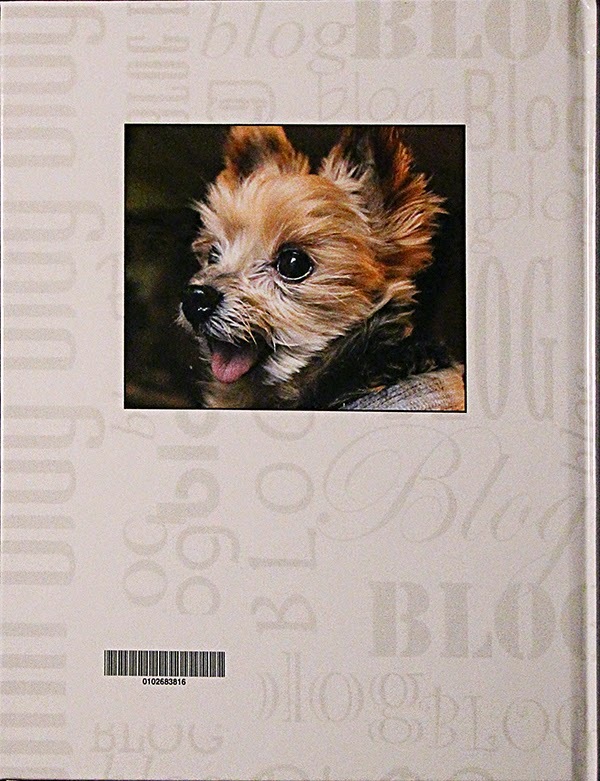 Two days ago was my seventh anniversary of blogging. It doesn't seem possible that I'm now in my eighth year. 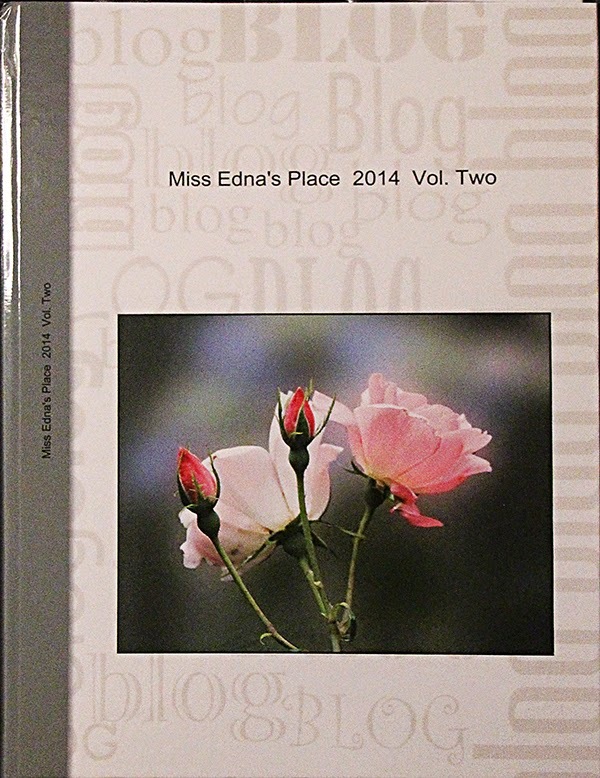 Here are photos of the new book. Today we are back to cold temps, only reaching about 30F later today. At least the sun is shining, so that makes it somewhat better. SIL Eddie just called and is on his way here to help me set up the new oven. I have a spot all ready for the oven, but now I want to give it a last once over with the wash cloth. Later, I'll have to sit down and read the instructions on how to use the oven. I've never had one of these, so this should be interesting. On that note, I'll take my leave. So, till tomorrow, Y'all have a beautiful day. Good afternoon. No, I did not sleep in this morning. Rather, I had a few phone calls to make, received a couple of calls, and then had to write out some checks to pay bills and get them in the mail before the mailman got here. Phew!! Before I could post, I needed to check my profile and figure out how to add an email to it so that folks can contact me if they need to. This was in response to Beth's question about how to send me photos to share. You can contact me, and send photos, by using the email in my profile at the top right side of this page. I would love to see your photos. Yesterday I had an appointment with my eye doctor, and all the news was super good. I have 20/20 vision and no eye diseases. Woo Hoo! The only reason I'll be getting new eyeglasses is because the ones that I'm wearing are really old. I need them for reading small print, plus I have Transitional lenses to keep the light away from my eyes. This was definitely great news. It seems as though I've been up for a whole day. Mr. Pogo decided it was time for breakfast quite early this morning. He woke me at around 5:30 to let me know that he was hungry. I decided to get up and make breakfast for both of us, with hopes of going back to sleep after we ate. Which I did, for about an hour an a half. Today I have an interesting newspaper article to share. 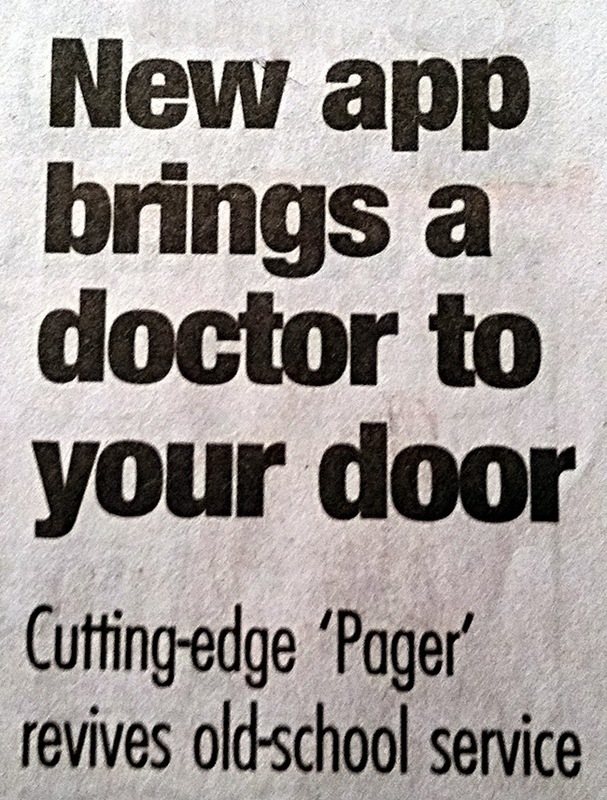 This a new app called "Pager" that allows patients to order a house call from a physician using their smartphones. At the moment, the service is available on a limited basis in Manhattan and Brooklyn (New York), but it could spread to other cities this year. Is this not cool? Remember the good old days when your doctor actually came to your house when you were sick in bed? It would mean not having to get out of a sick bed and traveling to the ER just to sit in a waiting room with a lot of other sick people, and quite possible getting even sicker. Hmmm, now I'm wondering what this service will cost. It's getting late and Pogo is patiently waiting for his lunch, so on that note, I'll take my leave. Till tomorrow, Y'all have a fabulous day. Good morning. This will be a fairly short post as I have a morning appointment with the eye doctor. It's been at least two or three years since my last eye exam. I've been wanting to get new glasses, but not until after a new exam. 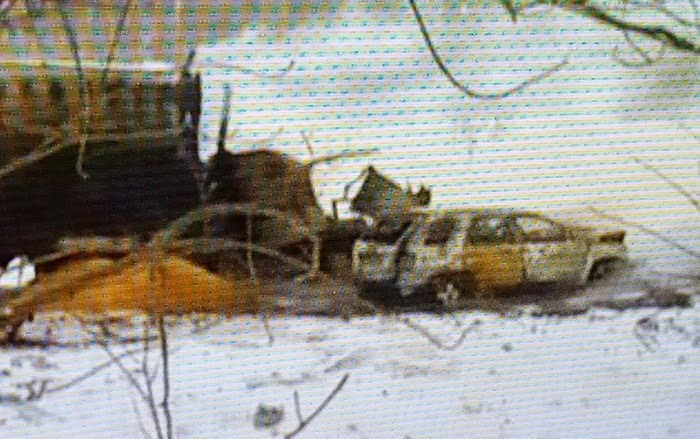 This morning on the Weather Channel they are showing all the recent vehicle pile-ups due to icy roads, plus they are re-hashing several of the other really bad pile-ups from this past week. I am just so amazed at how many people will insist on being out on the roads during freezing rain. Any time it rains and the temperature is below freezing, the roads will be icy. Is the almighty dollar so important to us that we will risk our lives and the lives of others by travelling on unsafe roads? I'm thinking that a lot of accidents may have been prevented if people had waited a few hours to travel to their jobs or destinations. Maybe I just think too realistically. At 3:30 this morning, it was 43F degrees. At the moment, it is 33 degrees, with a promise of maybe getting up to 40 degrees later today. The road near my house looks dry, but I will leave a bit early for my appointment just in case. If I find the roads looking a bit iffy, I'll turn around and come back home and re-schedule my appointment. Well, Deanne and Eddie are beginning to feel better, DIL Janet is over her bout with the flu, and Kevin is hanging in there till his upcoming doctor appointment. Hopefully they will all be healed and feeling normal really soon. Congratulations are in order for all you Patriots and Seattle football fans. Your teams will be facing off in this year's Super Bowl. Good luck to all of you, although I'll be routing for the New England Patriots, of course. Is anyone other than me trying to do that 365 day photo project? Are you having as much difficulty as I am trying to match a photo to the daily words? I may end up making my own word list in order to make the project more fun. In that case, today's word will be "water". I've taken a photo of our new bird water bowl. It's outside my window where it is protected from bad weather. Also, I can just open my window to fill the bowl with water. Well that's all my news for this morning. It's time to make breakfast for my little guy before I have to get ready for my appointment. So, till tomorrow, Y'all have a wonderful day and please stay off the icy roads. Good morning. It's getting close to noon, but I tried sleeping in this morning. Earlier I had to get up because Pogo was insisting on breakfast, which I got up and made for him. Then I crawled back under my cozy afghan and tried for a few more winks. However, there wasn't much sleep coming. Once his belly was full of food, Pogo now wanted to sit on my lap and play. So we played a while and watched a bit of Square Pants Sponge Bob (I think that's how you spell it). Finally, Pogo managed to coax me out from under the covers. What would I do without this special little guy? According to my phone, it is 44F degrees outside, sort of a mini heat wave. So far, it is not raining. However, we do have lots of rain on the way. At least that's what the weather man says. I guess the rain will arrive later this afternoon in time for the football game. I'm not a football fan, but I'll be routing for the Patriots because my family and friends will be watching the game and hoping for the Patriots to win. Remember how I mentioned how nothing is too sacred to be advertised on TV? Well the other day I saw a commercial that I thought was totally disgusting. It was for Poise Pads, and the last line of the ad was "How would you recycle your period pads?" Are they kidding? I'm all for recycling as much as possible, but give me a break! Poise Pads? I assume they are not referring to brand new ones. I mean, why would you bother to buy them if you were only going to put them in the recycle bin or create something new out of them? YUCK! 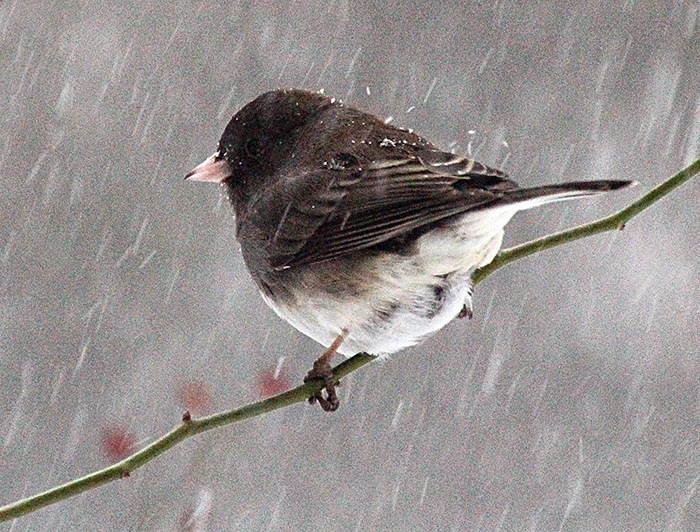 On that note, how about a few birdie photos. These were taken through the kitchen window. The window could use a washing, but not in this cold weather. Yesterday, I gave Joe two bowls of peanuts to spread around outside for the birds and the squirrels. I tried to get a photo of the squirrels eating the peanuts, but they would rush in, grab a peanut and run off with it. Oh well, at least they were enjoying them. I have no special plans for today. Somehow, when I plan exactly what I will do for a day, I usually get sidetracked. So today my plan is "whatever will be, will be". Right now, I'm thinking about what to make for lunch. A grilled cheese sandwich sounds yummy, but then I still have to come up with something tasty for Pogo. Hmmm, I'll have to think on that for a while. On that note, I think I'll have me a cup of coffee, and see what's in the refrigerator. So, till tomorrow, Y'all have a fantabulous day. Good morning. I'm off to a bit of a late start today, but I just did not want to come out from under my cozy covers this morning. I finally had to give in to Pogo's antics. He woke up quite hungry this morning, and was insisting that I get up and make him some breakfast. So, like a good mama, I did just that. Gosh, that little fellow has me tucked right under his thumb. Er, I mean his paw. On the weather channel they are discussing how we are all enjoying the "January thaw". I wonder if any of those folks have actually visited my little part of New England lately. I always thought that the temperature had to get up over freezing for the "thaw" and stay there for a while. So far, we're not doing so good in that department. We are expecting a day that reaches 40 and a couple days in the mid 30's soon, but until it actually happens, we can't count on it. The weather becomes crazier every year now. It must be quite difficult for the meteorologists to give accurate weather forecasts. As to the 365 photo project, I'm having a problem with some of the topics. So I think I'll just get the ones that I can, and try to catch up with the missed photos whenever I can. The word for day 16 is "impact". 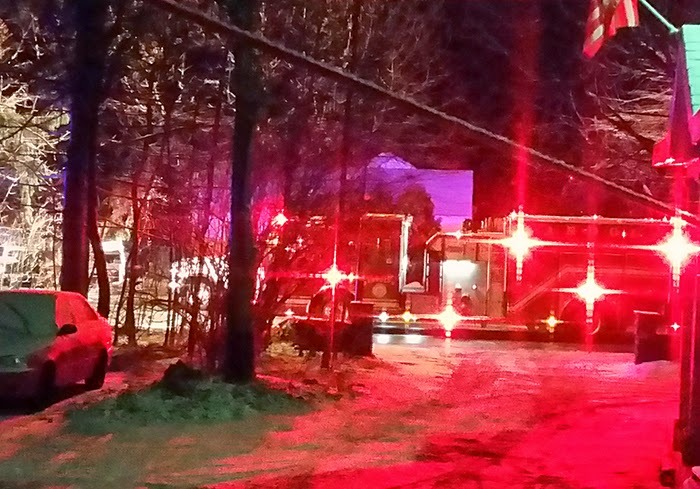 Last night while I was watching TV, I heard a really loud BANG! I got up and looked out to see what appeared to be a nasty auto accident, and so I called the police to report it. Next thing, all the traffic started backing up with a lot of vehicles turning around in my driveway and heading back in the other direction. Soon the whole area was flooded with flashing blue and white lights followed by flashing red lights. Several cruisers, an ambulance, three tow trucks, a ladder engine and goodness knows what else was all outside in front of our yard. 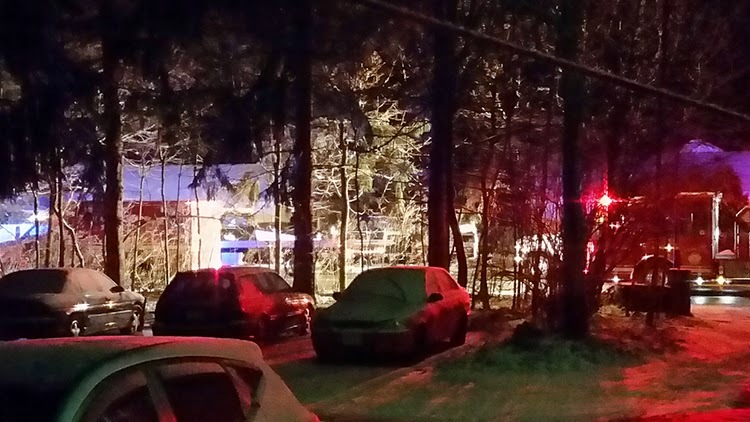 I did not go out to look, but I know it was serious because three cars were taken away on trucks, and at least one person left in an ambulance. 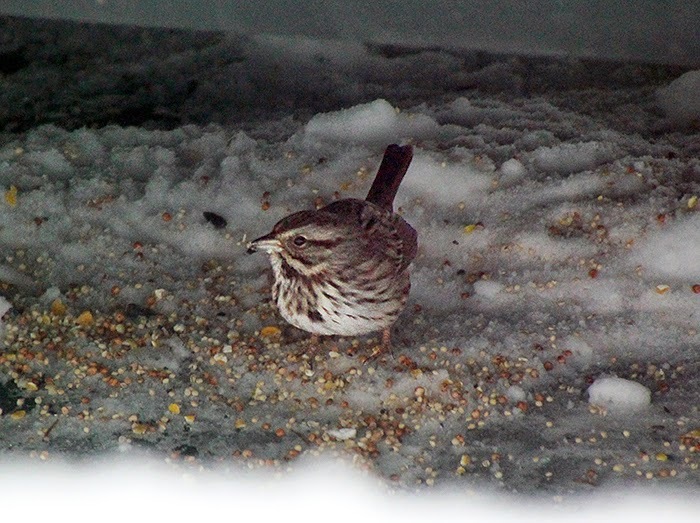 Here are a few photos that I took through the storm door. (with my phone) The last photo shows the EMT's who have just put someone into the ambulance. The photos aren't great as it is dark and I'm shooting through glass and screen with no flash. But they surely are colorful. These are for "Impact". My next photo is for Day 1 - "First". This was the first auto accident that Pogo has seen. He was quite excited with all the action taking place on the street in front of our yard. I do have an update on Audrey's auto. The insurance company called her to say that the car was totaled. Sadly, this was a nice little car, but now it's time to think about a new one. Hopefully, things will all work out and she'll soon have a new set of wheels to get around in. An update on Jazzy's rehearsals for the musical Wizard of Oz, her director said that she was so happy with how Jazzy sang "Over The Rainbow". When Jazzy was done singing, the director told her "that's why you were chosen for Dorothy". That's awesome, Jazzy!!!!! We are all so proud of you. Well, now it's time to get dressed. The oil delivery man will be here soon. Also, I see the mail truck pulling up in front of the driveway. Be right back. Oh goodie! A couple of days ago, I ordered some new memory cards for my camera and they are in today's mail. Woo Hoo! I'm already preparing for my upcoming vacation. I don't like to be caught without extra memory cards. Well that's the news for this morning. So, till Sunday, Y'all stay warm and have a beautiful weekend. Good morning. Today is cloudy and it's 25F degrees. At some time during the wee hours, it must have snowed for a while because everything outside is covered with a layer of snow. I'll have to run the car for a while to melt all the snow off it before going out to do errands later. 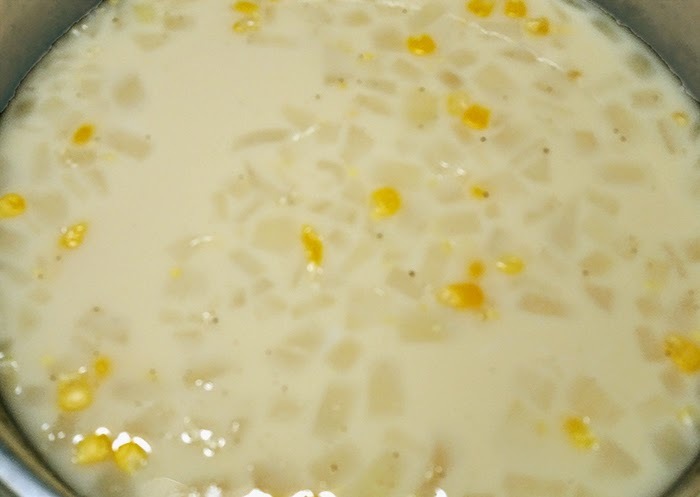 I did finish making the corn chowder yesterday, and it was delicious! I like my food plain, so there's not a lot of ingredients in my chowder. Just potatoes, whole kernel corn, creamed corn, onions, canned milk, whole milk a dash of salt and a sprinkling of pepper. If I'd had any bacon, I'd have put in a little bit of that too just for flavor. I spent a few hours on the kitchen project yesterday, mostly deciding what to toss and what to keep. Of course, anything that I would keep also needed a new place to live. I was going to work more on it today, but I think I'll take today off. As for my 365 photo project, sad to say I did not finish getting my two photos for days 14 & 15. Some of the topics listed are just not as easy, at least for me. My mind isn't as creative as it used to be in it's younger days. However, I will try to get them done. 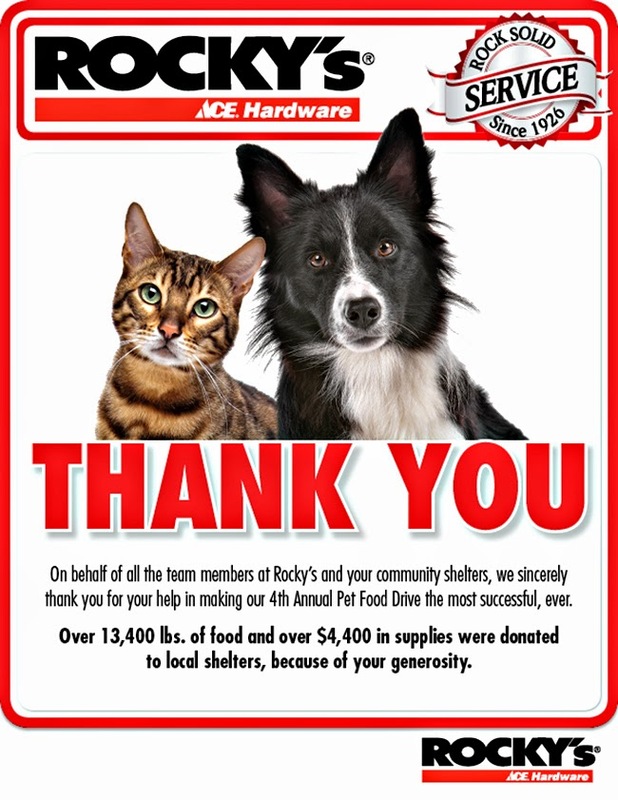 Remember back before Christmas that I spoke of our local Ace Hardware store's pet food drive? Well it seems to be getting better every year. I received this thank you email from the hardware store. I wish a lot more stores would do this, and it doesn't have to be just at Christmas time. Last night DIL Janet came by after work, and we finally got to open each other's Christmas presents. Janet has been sick since before Christmas, first waiting for an appointment for a root canal (for some reason, all the dentists in our area were totally booked until after the holidays) and then later with the flu. It was good to see her well and smiling again. This afternoon, I have to make my shopping list. Later, when Joe gets home from work, we'll be making a trip to the market. I mostly just need a few staples plus a few tasty meals for Pogo. This is always a challenge, trying to figure out what he might actually eat. He's such a picky kid. He likes hamburgers, but if I cook two at once (one for today and one for tomorrow) he'll only eat it on the day I cooked it. Now where did that come from? A few days ago, I order myself a "spin mop" from a catalogue. It arrived yesterday afternoon, so either later today or tomorrow I'll get to try it out. I have trouble wringing things with my hands, so I thought that this might make it easier for me. If it works, I'll get another one for out in the house. Audrey is on the mend, but Dee Dee, Eddie and Kevin are still a bit under the weather. Hopefully, they'll be well really soon. As for Audrey's car, it was being towed away this morning by the insurance company. Now we're just waiting for the decision - is it totaled or shall we fix it? Well, that's all the news for this morning. So, till tomorrow, Y'all stay warm and have a fantabulous day. Good morning. At the moment, it's 18F degrees with hopes of getting up to 30 degrees later today. Tomorrow is supposed to get a couple of degrees warmer. So that's the day I'll do my errands and the food shopping. For now, I'll continue to stay indoors and putter around the house. Actually, yesterday my puttering managed tot get a lot accomplished. I got my my little drawer units moved from the kitchen into the pantry, and I got my microwave all cleaned up and moved over to its new spot. This all happened because I went into the kitchen to make a pot of corn chowder. As usual, I got side tracked and ended up cleaning instead of cooking. So the chowder will be first on my to-do list this morning. To make sure it gets done, I've already started peeling the potatoes. Now I have to finish it! Yesterday I mentioned a new photo project that my friend Mary Ann had told me about. 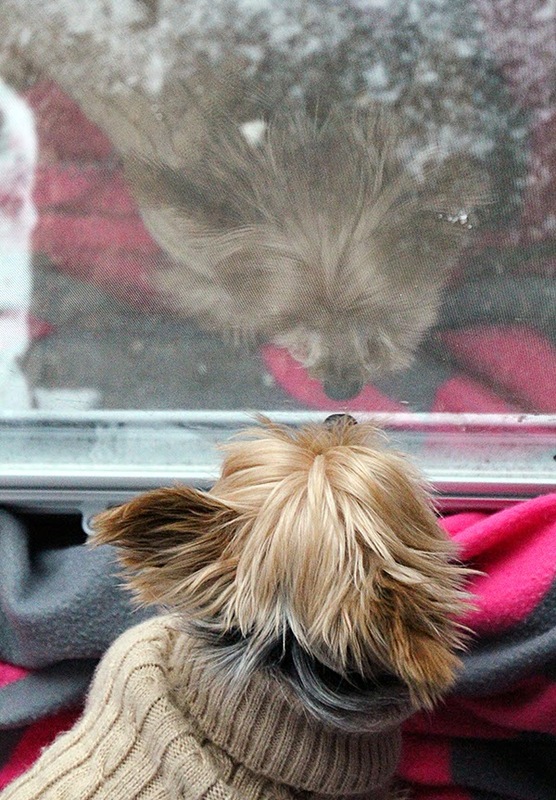 It's a 365 day photo project started by the Photographers Society of America (PSA). One has to be a member in order to browse their website, so I'm in the process of applying for membership. Meanwhile, I have the list of suggestions for January and February. For those of you who would like to give this a try, I'll try posting a couple weeks suggestions at a time. Seeing as how we are already half way through January, I'll post the whole list for January. 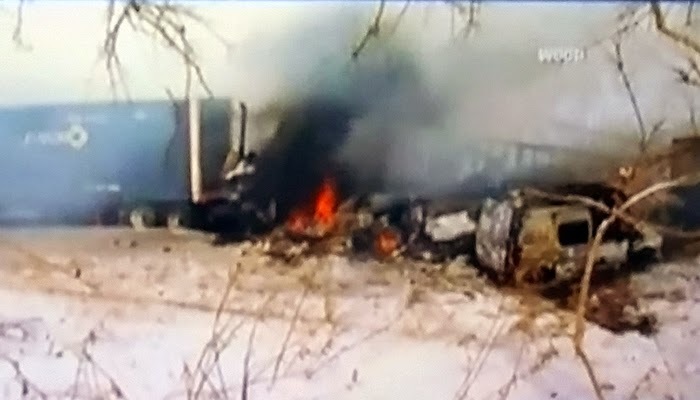 I just started this project yesterday, so today I'll post two photos for Day 13, of part of the 193 vehicle "smash up" that took place a couple of days ago in Michigan. (I think that's the location. I forgot to write it down.) I took these photos with my phone while watching the news on TV..
Today, I'll try to catch up with photos for day 14 & 15. When I can, I'll try to get caught up with the first part of the month. Give it try and have fun. While checking my email yesterday, I got an email from one of my favorite catalogues, asking me to check out some of their new items. So of course I did. They always have such cute things to look at. However, one of their new items caught my eye. TV seems to be advertising a huge array of feminine products lately. 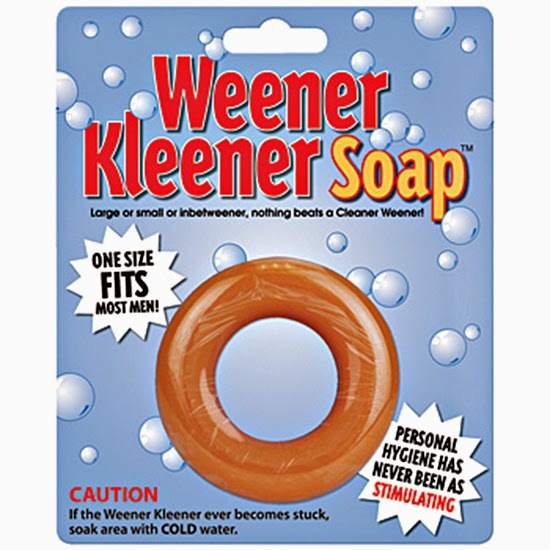 Now, finally, there is a product for the guys. It's amazing how far society has come with their attitude on personal products. Used to be, it was embarrassing to even try to buy personal products at a store. Now they are blatantly splashed all over the TV and in all our magazines. I suppose the good side of all of this is that folks really don't have a reason not to be clean. Back to the weather, we do not have any ice outside here or on our roads, but a huge portion of the country is covered in ice. If you are in any of these areas, please do be careful if you have to go out today. If at all possible, stay home and let the highway department try to melt some of that ice. My daughter Audrey called me last evening after she had arrived back home from work. She started the conversation with "Do you want the good news or the bad news?" Well, the good news was that she was okay. Oh boy, now I'm getting nervous. The bad news was that her car might be totaled. 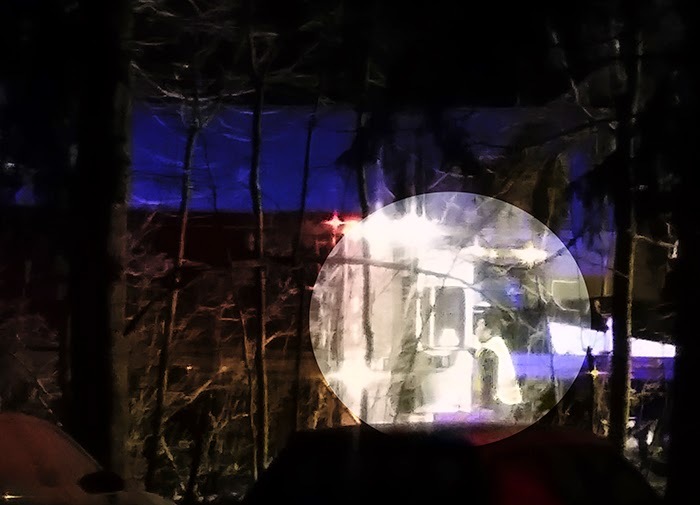 On her way home, a huge buck ran into her car, and then managed to run off into the woods. The car, however, was heavily damaged. Even the driver's door was jammed shut. Through it all, she managed to keep a sense of humor about her. She said "Mom, this was not how I wanted to get my deer". Later, hubby Mac and a friend went off into the woods to look for the deer to make sure it was not lying wounded somewhere. Audrey, if you take a photo of your car, you'll have your day 13 "smash" photo. Just thought I'd mention that. Well now it's time for me to get back to those potatoes that I started peeling before they turn black. So, till tomorrow, Y'all be safe and have a wonderful day. Good morning. Wow, it was quite warm all through the night (in the low thirties) and by morning it has cooled down quite a bit. It is now 22 F degrees and getting colder as the day goes on into night. Yesterday's nasty weather did not quite make it here. We mostly had a very light rain for about half of the day. However, a lot of other folks are getting a lot of icy roads today and tomorrow. I've been watching the Weather Channel to see how close this ice gets to my daughter Audrey. She does not like driving on major roads, and the ice will make her drive to work (and back home) very treacherous. Be very careful Audrey. 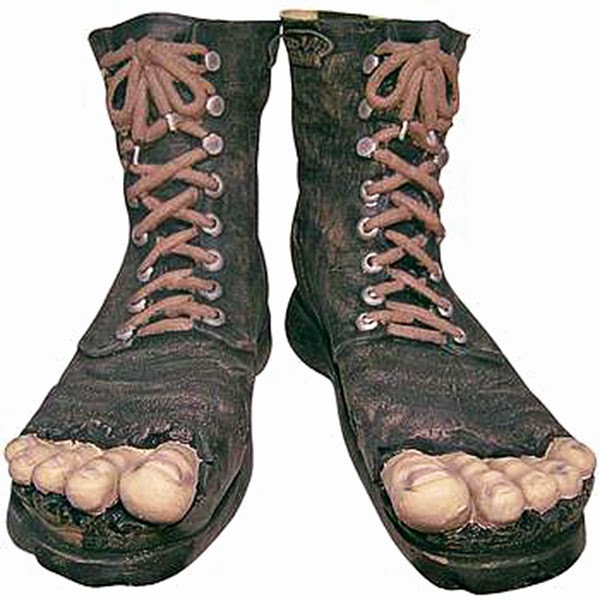 I have an image that I borrowed from the web of some rather interesting footwear. They are called "Hillbilly Shoe Covers". You can buy them from a catalogue "The Lighter Side" for only $32.98. Wearing these to work should make one's day quite interesting! You put them on right over your boots. (or shoes too, I guess) Could this maybe be the start of a new footwear craze? 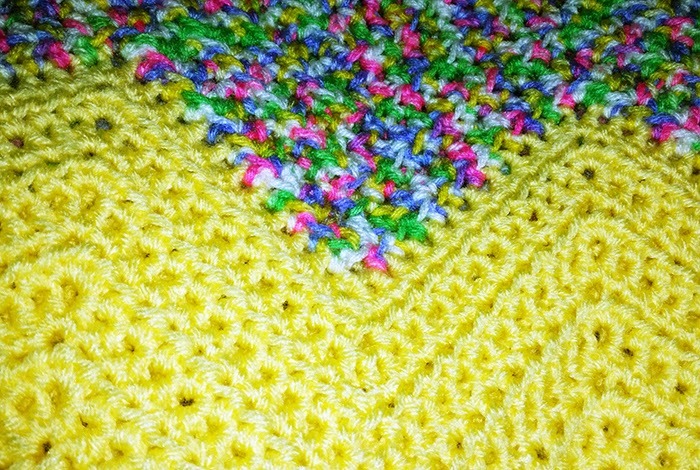 I promised you a photo of my "Sunshine" afghan. I took the photo with my phone last evening while I had the afghan on my lap. (working on it) When I have more of it done, I'll take another photo. The colors are hard to capture under a regular lamp light. I'll try taking the next photo in daylight to see the difference. I have another photo project to share, but first I need to check with a friend to see if it is okay to post it here on my blog. After all, it is not my own idea. 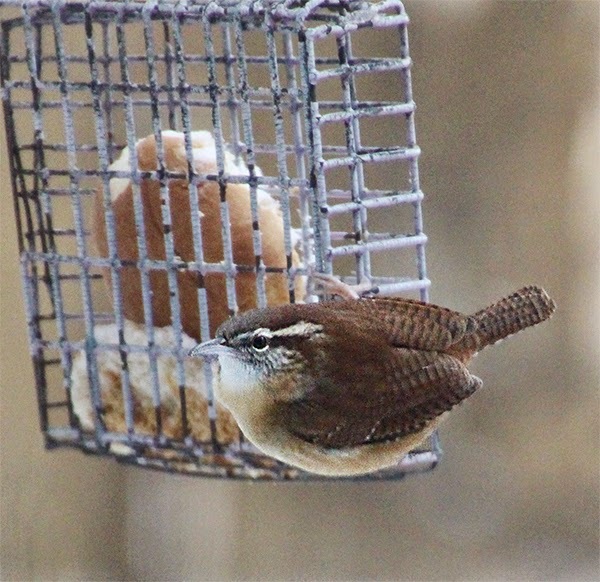 Today, I was hoping to get out to shop for a new tree and more birdseed, but I may wait till tomorrow or Thursday when it is warmer. We'll see. I'm thinking that today is a good day to stay indoors and make a pot of corn chowder. Yup yup, I think that's what I'll do. Well that's my news for this morning. Now I think I'll have me another cup of coffee while I do a bit of blog reading. So, till tomorrow, Y'all do stay warm and have a wonderful day. Storm Frona, You Are Wicked!! Spring Is Only 78 Days Away! !